Transport: train and citylink bus serve Aviemore. This route is so popular I feel like one of the last outdoors enthusiasts in Scotland to have done it! 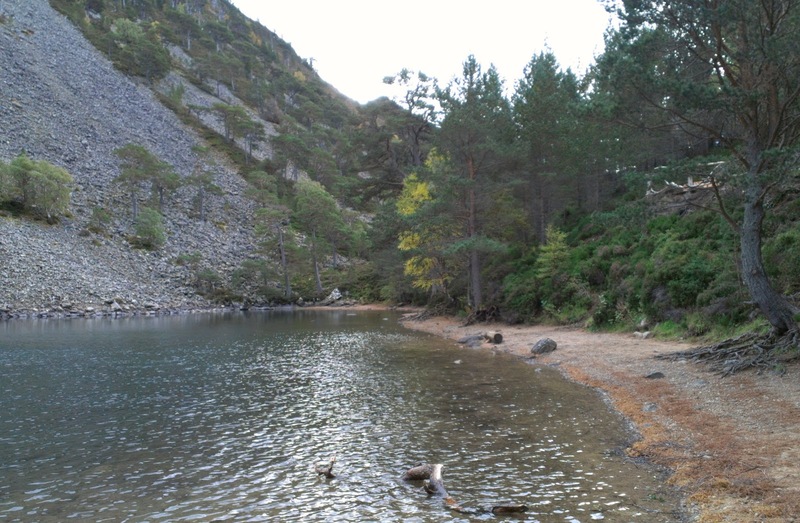 Lesley had cycled it many times before, a girl at work had also reccommended it, and during breakfast at our accommodation in Boat of Garten, our host went and suggested it too! Not that we were particularly in the mood for a "mission" after a late Friday evening in the Boat Hotel! I can now see why its such a favourite - rarely on road and passing through forest, mountains and moorland, yet mostly flat and easy going (just one or two brief parts that require care if on a bike). 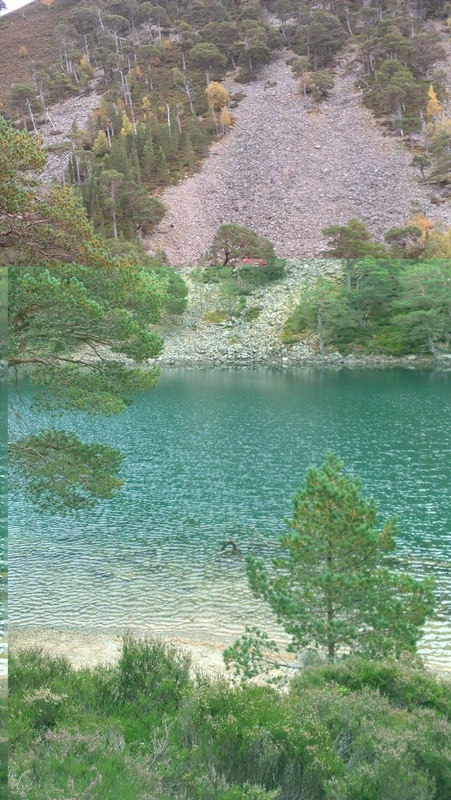 And there's some gems en-route such as "The Green Loch". In spite of all the endorsements there is only a short section of the route which felt "busy" this weekend. The views deeper into the Cairngorm wilderness really caught my imagination for future exploration. I've mentioned before that September/October is my favourite time in Scotland. Okay it was baltic, but we were lucky to wake up to blue skies, still air, frost on the ground. Boat of Garten was silent, the air tinted with woodsmoke. We extracted Lesley's bike from the boot of the car and quickly got moving East out of the village via the bridge over the alluring River Spey. 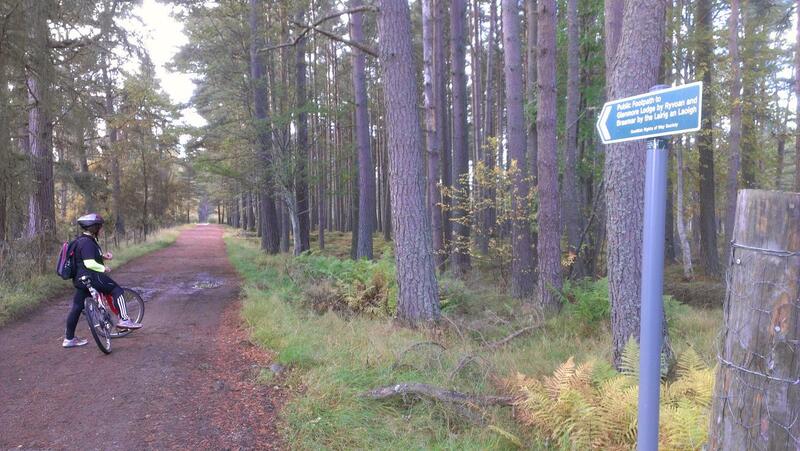 Lesley pedalled along the road whilst I jogged along the adjacent "Speyside Way". It was probably only once we'd escaped the road, empty though it was, and entered Abernethy Forest that we really started to enjoy this journey, the groggy too-many-beers-last-night feeling being replaced with how lucky we were to be here! The pine forest had the ubiquitous carpet of heather, blaeberry and an occasional ant-hill. Blue sky above, dew sparkling in the sunlight, birdsong accentuated by the stillness, and now we'd done a couple of miles the coldness was refreshing rather than bitter (like the Guinness at Aviemore later). We shunned the road-side route of the speyside way to take the loop through the trees, then picked the "way" back up as it parallelled a single-track road for a bit then headed East again towards the wee town of Nethy Bridge (shop). After a break at the picnic tables by the River Nethy, we followed the road up past nice river-side homes we wish we owned, eventually onto gravel and back into the forest. It was starting to cloud over now as we pedalled/ran deeper into the woods, a very subtle gradient taking us up towards Forest Lodge and the RSPB nature area. There was a choice of routes and we accidentally took the higher one up to Rynettin Farm, which was worth the extra effort for the view across the moorland into the Cairngorms proper, the higher points of which now carrying a dusting of recent snow. It was a bit of a surprise exiting the forest and passing by a field of cows - with boarded-up farm buildings above - having seemingly left civilisation a few miles ago. From here we were entering the mountains, but never having to climb them - the track dropped down from the farm to join the easier route that we'd missed, then undulates along the moorland, flanking the Corbett "Meall a' Bhuachaille" (also a popular walk in its own right, with a manicured path up to its summit from Ryvoan Bothy - this area was the only "busy" part of our day! There's a hill race up Meall a' Bhuachaille in October, although this shuns the manicured route and goes straight up the side!). The rain was coming down as we approached Ryvoan bothy, so we took shelter there and were soon joined by many others. Lesley produced the hip-flask, obviously trying to slow me down! She didn't need to worry as it was mostly downhill from here - although a bit of care is needed when cycling the immediate descent S from the bothy. 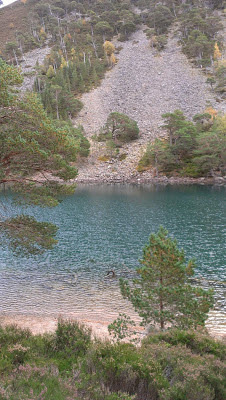 At the bottom of this hill is the beautiful An Lochan Uaine (Green Loch), so time for another stop.